Witnessing a giant swallowtail (Papilio cresphontes) in flight is an incredible experience. It is the largest species of butterfly found in the US and Canada and with its yellow and black wings, it is impossible not to take pause and watch it flutter around the canopy. I will never forget the first time I saw one as a child. It was one of those moments that solidified my obsession with the natural world. Fast forward a few decades and now I can't help but ponder what kind of gardening I would need to do to attract these incredible insects to my yard. What I discovered surprised me to say the least. I had to plant something in the citrus family. We are all familiar with the fruits of various Rutaceae. This family contains the genus Citrus, providing humanity with oranges (C. × sinensis), lemons (C. × limon), grapefruits (C. × paradisi), and limes (mostly C. aurantifolia). These are largely tropical and subtropical trees, struggling to hang on anywhere temperatures dip below freezing regularly. How on Earth was a butterfly whose larva specialize on this family flitting around in temperate North America? What's more, reports place this species as far north as southern Quebec. I was obviously out of the loop on the taxonomic affinities of this family. A little detective work turned up some surprising results. Temperate North America does in fact have some representatives of the citrus family. They are a far cry from an orange tree but they are nonetheless relatives. This inquiry actually solved a bit of trouble I was having with some riparian trees in my neck of the woods. As some of you probably know, trees are not a strong point of mine. I had encountered a few small woody things with compound leaves of three and dense clusters of greenish flowers. At first I thought I had found a rather robust poison ivy specimen but closer inspection revealed that wasn't the case. Instead I had stumbled across something new for me - a common hoptree (Ptelea trifoliata). This cool looking tree is one of the giant swallowtails larval host trees, making it a member of -(you guessed it)- the citrus family. More often this small tree grows like a shrub with its tangle of multiple branches but they can reach some impressive heights, relatively speaking of course. Trees topping out at a height of 5 meters are not unheard of. Another common name of this tree - wafer ash - hints at its superficial similarity to a Fraxinus. Its compound leaves and wafer-like samaras are a bit of a curve ball for northerners like myself. It has a rather wide and patchy distribution throughout North America, and many subspecies/varieties have been named. The other bit of this taxonomic journey involves another small tree, although this time I was better acquainted. Another host for the giant swallowtail is the prickly ash (Zanthoxylum americanum). It is interesting to note that both of these northern host trees superficially resemble ashes but I digress. The prickly ash is also small in stature and is most often found in thickets consisting of its own kind. As its common name suggests, you wouldn't want to go barreling through said thickets unless you wanted to donate some blood. It is well defended by sharp prickles on its stems. It does produce fruit but they are rather small and berry-like (technically follicles) and are distributed far and wide by birds. Both trees are rather aromatic. They produce volatile oily compounds like most of the family, making them smell quite pleasant. Their small size makes them interesting specimen trees for anyone looking for something unique to put in a native landscape. 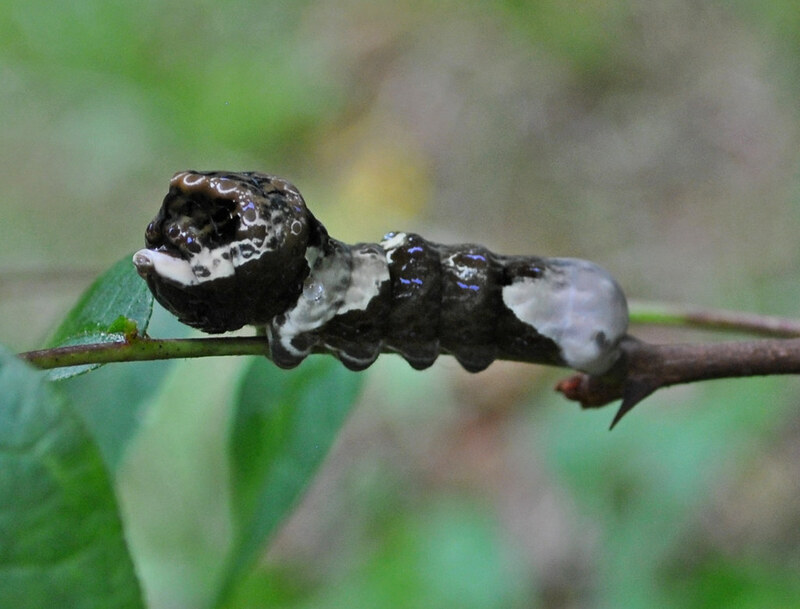 What's more, they host a variety of other larvae as well, including those of the spicebush swallowtail butterfly (P. troilus). Together, these two species are the most northerly representatives of the citrus family, making them quite special indeed. I am happy that my interest in attracting giant swallowtails to my property resulted in a fascinating dive into the geography of this interesting family.